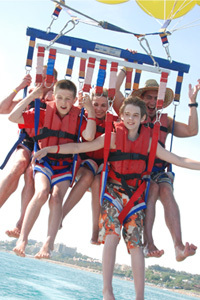 Pegasus Triplizer is designed for three persons, so you can fly as a family. No matter the weight difference of the persons flying. The bar system allows the weight to be adjusted. The metal section of the Triplizer is made of aluminium and is coated with Polycarbonate. A padded covering protects the persons flying. All carabiners and items are 316 Marine stainless (Inox) with heat welded joints. Pegasus Doublizer is flown with two persons. During the flight it lets you enjoy being together with people you love. It is even possible to have a conversation. The metal section of the Doublizer is made of aluminium that is coated with Polycarbonate. A cloth covers the casing, you never see the aluminium on a Pegasus Doublizer stick. It is designed to avoid harm to a persons head or touching any areas of the body in the course of flight.